Online gambling, and particularly online sports betting with real money, has been around for years. Since almost 20 years now, there have been sites that provide various types of games such as poker and roulette, as well as basically every sport known on earth. Up until now. The new trend on the market is betting on eSports (aka competitive gaming of computer games). It appears eSports is the new niche that every major online betting website is trying to get a hold on. 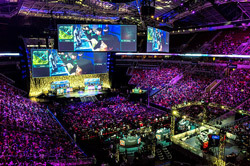 Professional gameplay has earned its place amongst the traditional sports with huge spectator numbers. For example, only one League of Legends (LoL) tournament in 2014 got ~30 million viewers ranking it above the baseball World Series which is the second most watched sport in the states. eSports have proved to be an equal to every other sport, and now it’s even up for consideration about being an Olympic sport. You might ask: What is eSports? Competitive gaming has been a huge tendency lately, but what is it really? eSports is a generalisation of several commercially popular (online) computer games that feature professional tournaments and events with prize pools for the playing teams. This has grown so big, that the biggest players in the industry reach more than several 100 million viewers and pay prize pools and salaries beyond 100 million US dollar per year combined. Betting on Dota 2: Dota2 is Valve’s successor to the classic DotA based on Blizzard’s Warcraft III. This game is very similar to LoL, although it is a bit less popular since it has a steeper learning curve and is harder to learn for most people. Betting on Starcraft II: SC 2 is one of the few eSports that is not played with a team but 1 vs. 1. Betting on Counter-Strike: Global Offensive (CS:GO): CS:GO is a first person shooter strategy that features a competitive 5v5 mode. These are the big four when it comes to eSports, but there are other games such as Hearthstone and Heroes of the Storm that are picking up players and a fanbase as well. Due to the extreme popularity of gaming (almost every person in the world is some kind of a casual gamer, regardless of whether it’s LoL on a PC or Angry Birds on your phone), big companies in the online betting business have picked up this niche for real money bets. The first early mover is Pinnacle Sports and they’ve been providing eSports bets since 2010. This site has a specialised eSports Hub where you can find articles and videos about the latest news in the competitive gaming scene. There are also ones that give you information and tips about how to bet on eSports. Other big players on the market include bet365 and bet-at-home. These are all sites that are giants in having a huge portfolio of traditional sports, but following Pinnacle’s success in the eSports niche, every major player is looking forward to get a bigger market share. There are also a new type of eSports specialised sites such as EGB (egamingbets) that try to win customers with better eSports odds and more available leagues. eSports betting with real money is not drastically different from betting on the traditional sports. Of course, it requires some knowledge of the particular game and the rules, but generally you bet on which team is going to win. Most of the games, though, are either best-of-3 or best-of-5 and you can place a bet on each particular match. Moreover, some more specialised sites provide live betting or the so called “special bets”. Live betting happens through a stream of the game and you can place bets even after the game starts. The special bets include betting on First Blood (which team gets the first kill), First Turret (which team destroys the first objective/tower) and many others such as Handicap (which team is going to win if the other has a +1 advantage). Since eSports is not a completely developed niche in the market, special bets are not available everywhere. More and more online betting websites are trying to incorporate these bets, though, with the intention of getting a bigger customer base. Other things to look for when searching for the right bookie for you are things such as bonuses/rewards, customer service ratings and where the company is registered. For example, many sites have exceptional bonuses for eSports customers including 100% bonus to your first deposit, cash rewards if you bring your friends or competitions where the person who bets the most receives a betting voucher. Find out more about bonus promotions for esports betting. Customer service is really important when it comes to eSports. As noted above, competitive gaming is familiar to many, but it’s also not that well-known to a lot of people. Having a 24/7 customer service that can answer your questions and help you place a winning bet may be crucial to your success in this niche. Lastly, it is essential to do a background check on the site you’re betting in. Many sites that don’t have a history are registered in offshore zones where regulations are not intact. You have to be sure that the company is required to hold enough cash to satisfy the winnings of its customers. A good example of a reliable company is bet365 which is licences by the UK Gambling Commission where the standards are exceptional. Thus bet365 has a really good reputation of a respected and reliable online betting website. As you can see, eSports betting is not that different from placing bets on traditional sports. You should expect that as a niche that continues to grow, more bookies are going to adopt eSports. Since competition is always good, the future of betting on competitive gaming probably features better odds, more special bets and a bigger portfolio for most sites. eSports are a huge trend all around the globe and with the bigger customer base, improvements are sure to follow. The only thing that remains is to find the proper site for you and test your skills in betting on the most popular leagues.